Even though it feels like summer again here in sunny San Diego, I’m inspired by all the ”autumnal recipes” & beautiful pumpkins I’ve been seeing everywhere! Combine almond milk with the tsp vinegar in a separate bowl. Give it 5 minutes to curdle (this is like using buttermilk). Stir together pumpkin, spices, water & almond milk in mixing bowl. Add remaining ingredients & stir until most. Let sit 5 minutes to rise & lightly stir again. Let rest 5 more minutes & cook them up. Makes twenty 4” pancakes. 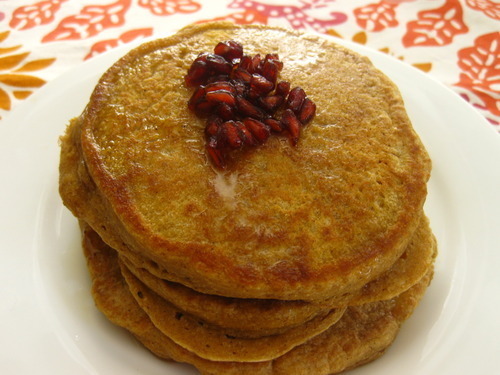 ***I sprinkled dried pomegranate seeds on top & served with Earth Balance Spread & Trader Joe’s Organic Maple Agave Syrup! My daughter has a severe dairy allergy as well as an egg allergy so finding a good pancake for her used to be a challenge… until I found these!! Not only does she LOVE them they are by far our whole family’s favorite pancake! I make them at least once a week or more and take them everywhere with us when traveling or to restaraunts for her! It always broke my heart that she couldn’t enjoy pancakes at a restaraunt if we all went out… now I take these and she enjoys breakfast with everyone else:) Such a blessing to a child with food allergies! And a huge blessing to a momma with a child with food allergies! Thank you for this amazing recipe!